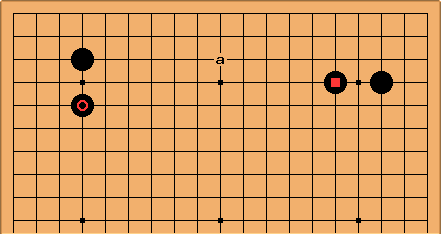 This position is basic for understanding the enclosure opening. It was assumed before komi go that White should prevent Black from making this formation. Classically White assumed the need to intervene either at with (Shusaku fuseki) or at (enclosure opening). Black assumed that was a bigger play than . If Black does get to play both and , how will the game go in this half of the board? What is seen in pro games is that both players will usually pay attention to big points at or near the marked points first. Black's play to build up the framework is at a, for balance. But he doesn't necessarily rush to play there, which would be a rather one-sided strategy. 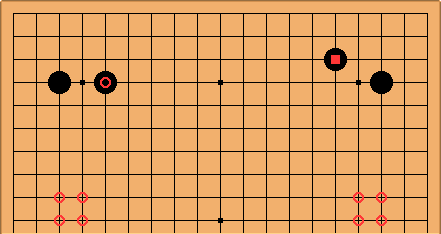 White too is not likely to play on the upper side directly: there is a ten-line space, meaning that a wedge can easily be played there. But that doesn't mean that White's priority is in that direction, looking at the whole board. In contrast, when and are played high in this fashion, the point a becomes very important; and both sides are keen to play there. The difference in this case is that the small high enclosure is much better for building a really large-scale framework. When is on the third line there are good reduction techniques such as the cap or shoulderhit. But when is on the fourth line those techniques no longer apply. There are more chances of a corner invasion: but that may be premature in any game position where the main struggle takes place in the centre. 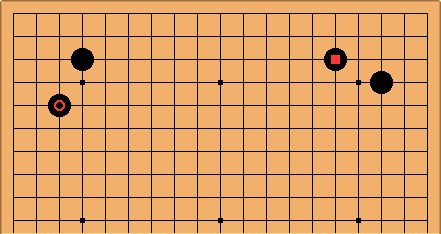 Here we can call Black's position 'flat' because all stones are on the top four lines of the board. The choice of and is relatively common, when pros have the chance to make two enclosures in this way. It's a matter of balance to have high (fourth line) but low (third line). They do play two high enclosures, but (apparently) not two low enclosures. White universally plays to get a stone into the marked areas, before coming in on the upper side. Black too takes a big point rather than play immediately there.